A custom made mouthguard or gum shield which fits exactly over your teeth and gums, protecting them from damage during sports. The rubber-like protective cover is recommended when you play sport that involved physical contact, including cricket, hockey and football, which can cause broken and damaged teeth. Surrey Mouthguards are made in a professional laboratory based on our instructions. Can even display your name! We make custom made mouthguards for Reeds Rugby club for £50.00. It features your name and comes in Reeds Rugby colours. 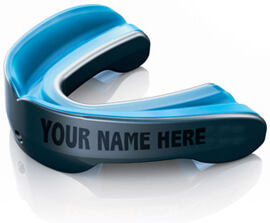 We make custom made mouthguards for Esher Rugby club for £50.00. It features your name and comes in Esher Rugby colors.